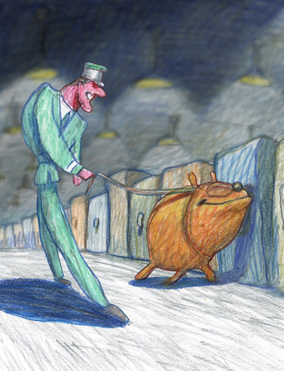 The sixth film in Bill Plympton's Oscar-nominated Guard Dog series, in which our plucky hero has a new occupation: patrolling our airports sniffing for illegal drugs. You know that's not going to end well. Bill Plympton is considered the King of Indie Animation, and was nominated for an Oscar in 1987 for his animated short Your Face. In 2005 he received another Oscar nomination for his short Guard Dog. Bill has also directed the animated features The Tune, I Married a Strange Person, Mutant Aliens, Hair High, Idiots and Angels, Cheatin' and Revengeance, which will be screening at the 2017 Woodstock FIlm Festival. He has also collaborated with Kanye West, Madonna and Weird Al Yankovic on a number of music videos. In 2006, he received the Winsor McCay Lifetime Achievement Award from the Annie Awards.